Jonah Altmann greets candidate Peter Jacob at a fund-raiser hosted by the teen in his Westfield home. At age 13, Jonah Altmann is already a veteran political activist. When he was six-years-old, he went door to door with his mother campaigning for then-presidential-candidate Barack Obama. In the seven years since, he’s participated in phone banks, attended meet and greet events, and taken part in more canvassing for other candidates for various offices. 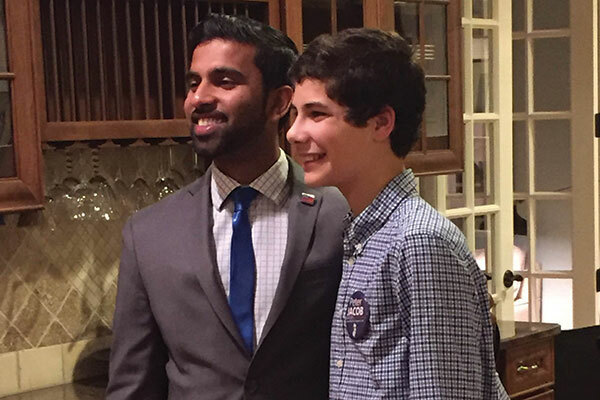 On Oct. 14, he hosted his first fund-raiser at his Westfield home, for Peter Jacob, the Democratic candidate for the Dist. 7 congressional seat held by Rep. Leonard Lance (R). “It went great,” said Jonah at his home the following Sunday morning. “There were a lot of people, and Peter spoke really well.” The Golda Och Academy eighth-grader estimated the turnout at between 10 and 15 people who came from Westfield, Garwood, Cranford, and even Princeton Junction, and he was thrilled that they donated between $50 and $350 each. And, Jonah added, some people who couldn’t come also sent checks. The campaign said the fund-raiser brought in a total of $6,000. Jonah told NJJN he started the campaign season working on behalf of Vermont Sen. Bernie Sanders when he was running for the Democratic presidential nomination. “We did a phone bank at home, and Peter [Jacob] showed up. We kept in touch and he said, ‘We’d love for you to host a fund-raiser.’ I was very excited,” said Jonah. The campaign actually credits Jonah with the idea to host a fund-raiser, but both agree that Jacob was interested in hosting some kind of event. Jonah was less enthusiastic about holding the fund-raiser on Shabbat, he said, but was convinced after Jacob’s campaign manager, Joshua Levin (whose father is a cantor), explained that Friday nights are the best nights for fund-raisers. “My grandparents came over, and we lit Shabbat candles and made Kiddush before the fund-raiser,” Jonah said, regarding the compromise. Jonah has “always paid attention” to politics, he said, or at least since he was six. Asked why, he said, “This is everyone’s future, what’s going to happen.” It matters to him even though the people he’s approached are not always nice. He remembers that during the 2012 election season, while he was knocking on doors in support of Obama, one supporter of Republican challenger John McCain was “very rude” to him. He also remembers his first phone bank experience for Obama that year. “We went through list after list and nobody picked up. Then someone picked up. I was so nervous I dropped the phone,” he said. But he managed to pick it back up and started talking to a woman at the other end. “She was really nice,” Jonah recalled. Asked why he decided to back Jacob, Jonah said it was because of his “progressive” views and his support for Israel’s right to exist and for a two-state solution to the Israeli-Palestinian conflict— and because he likes Jacob’s motto, “People over politics.” To Jonah, that means Jacob “will be there for the people.” Jonah can discuss Jacob’s positions on social security, on Israel, on how he differs from Hillary Clinton, even on voter registration. What he really supports is Jacob’s plan in support of “raising taxes for the rich” to provide for the rest of the community. Although Jonah said there’s a current events club at Golda Och Academy, and there are definitely people there who know about politics and the election, he is the only one with a Peter Jacob sticker on his locker at school. His interest comes largely from his involvement at East Brunswick Jewish Center as well as GOA. And on Nov. 8, he has no intention of staying outside the election booth. In fact, he said, he intends to go into the booth with his parents “to make sure they vote” for his candidates.